The researchers were surprised to find that in most ways, this child's dental development was very similar to what you would find in a child today, said Debbie Guatelli-Steinberg, co-author of the study and professor of anthropology at The Ohio State University. 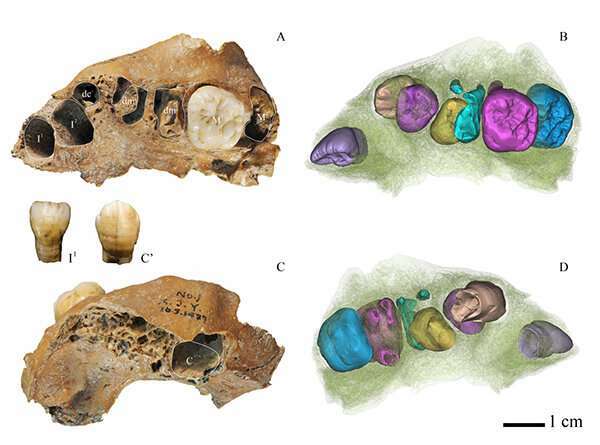 "The Xujiayao juvenile is the oldest fossil found in east Asia that has dental development comparable to modern humans," Guatelli-Steinberg said. "It may suggest that these archaic humans had a slow life history like modern humans, with a prolonged period of childhood dependency." Teeth provide some of the best data anthropologists have about the growth and development of our ancient ancestors, she said. That's because growth lines in teeth retain a record of dental development. Compared to our primate cousins, modern humans—including their teeth—take a long time to form and develop. Anthropologists believe this characteristic is associated with humans' longer periods of child dependency—how long a juvenile relies on support from a caregiver. "We don't know exactly where this enigmatic East Asian hominin fits in human evolution," said Song Xing, lead author of the study, who is at the Chinese Academy of Sciences in Beijing. "It has some affinities to archaic human relatives like the Denisovans and Neanderthals with, as we found, some more modern features. It is a strange mosaic." Using the growth lines in the teeth, the researchers estimated the death of the Xujiayao juvenile at about 6 1/2 years of age, said study co-author Mackie O'Hara, a graduate student in anthropology at Ohio State. The first molar of this juvenile—what we call the 6-year-molar today—had erupted a few months before death and had started to wear a bit. The root was about three-quarters complete, similar to humans today. "We found that this juvenile was growing up—at least dentally—according to a schedule similar to that of modern people," O'Hara said. 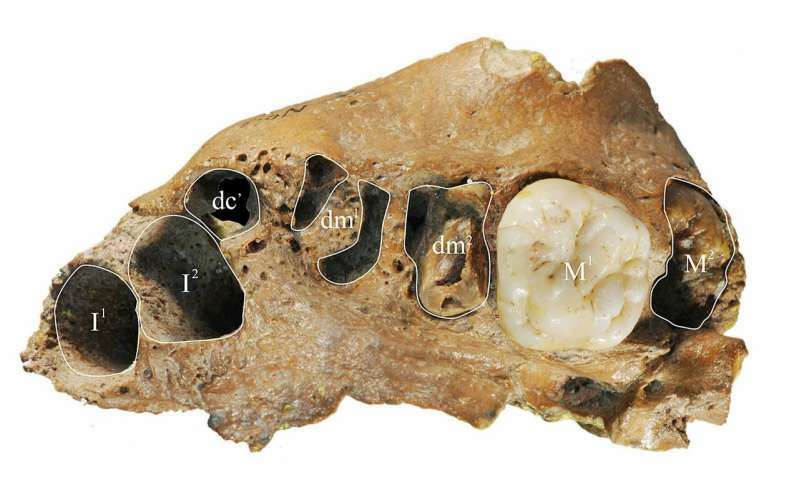 "We found that the way these perikymata were distributed on the Xujiayao juvenile teeth was close to what we see in modern humans, and not to Neanderthals," Guatelli-Steinberg said. "This juvenile had a 10-day rhythm, which you don't see very often in early hominins," she said. "Most of the early hominins had a shorter rhythm, closer to seven days. This is another aspect that is much more modern." 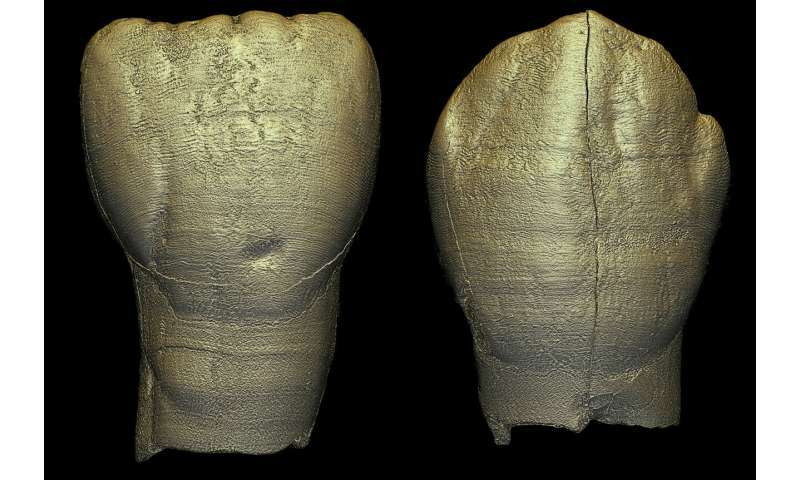 While the dental development of this juvenile suggested it had a slow life course similar to modern humans, Guatelli-Steinberg cautioned that we don't know what happens in later childhood in hominins like this one. "It would be interesting to see if dental development in later childhood, such as the growth and development of third molars, was also similar to modern humans," she said. I allays knew weekends should be 3 days long. Probably we couldn't tell much difference between these and us. Most likely we could interbreed with them, since it's proven we could with Neanderthals. It will be interesting to see what gets made of these over the next decade or two, if we can find more fossils. We also could interbred with Denisovans and possibly at least one other lineage in Africa, as well as Denisovans likely interbred with an earlier split (such as [i]H. erectus[/i ] which was present in the area). But here is a new candidate for fossil find in the area, a putative lineage of an ancient Neanderthal-Denisovan hybrid nearly as old as its two ancestral lineages: https://phys.org/...man.html . Guy with the tooth on the right played ice (age) hockey.